This outstanding short study provides a merciless demolition of the central claims of the Holocaust thesis by way of a probing examination of Raul Hilberg's canonical The Extermination of the European Jews. By narrowing his focus to those pages in Extermination that deal directly with the plans, program, method, and numerical results of the alleged Nazi mass murder of the Jews, Swiss researcher Graf relentlessly exposes the weakness and, often, absurdity of the best evidence for the extermination program, the gas chambers, and anything like the six million death toll. 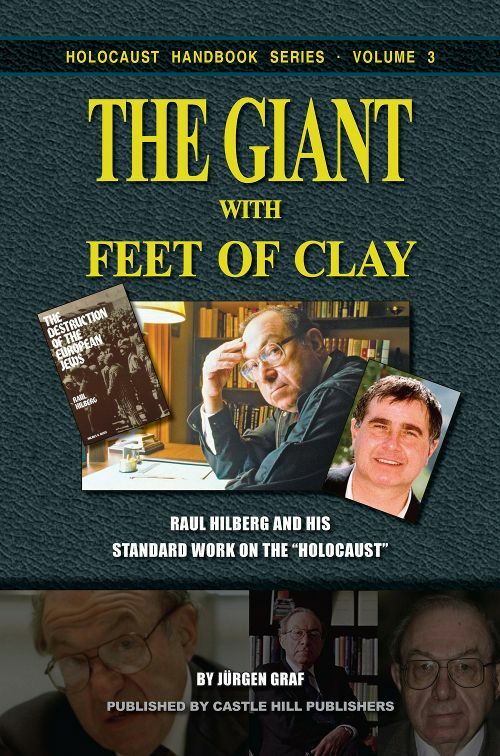 Giant can be devastatingly funny in its deconstruction of Hilberg's flimsy attempts to portray mass gassing and cremation at Auschwitz and Treblinka; its focused brevity makes this book both an excellent introduction and a fine refresher course on the essentials of the revisionist case. 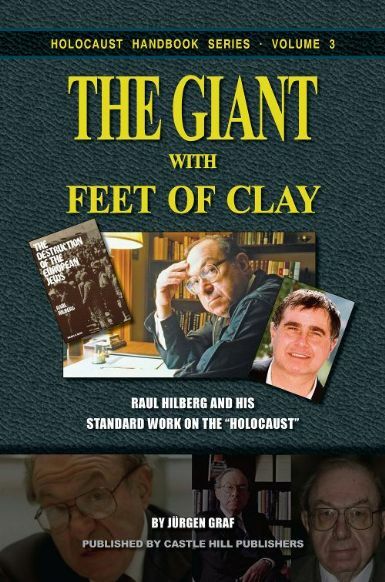 "It was Professor Arthur Butz in his Hoax of the Twentieth Century who proposed the image of the holocaust as a giant with feet of clay. By drawing on the analyses of revisionist historians and incisively pointing out inconsistencies in the documentary, physical and 'eyewitness' testimony, Jürgen Graf finds in the present study that, although the major portion of Raul Hilberg's bench-mark work rests on reliable sources, its title should have been 'The Persecution of the European Jews' rather than ''The Destruction of the European Jews'.. Hilberg, by selecting an inaccurate title, has supported Professor Butz' notion that the Holocaust story has feet of clay." —Prof. Dr. Costa Zaverdinos, University of Natal, South Africa, rtd. "This book has great educational value provided it is studied rather than merely read. Some may wonder why Raul Hilberg's 40 year old work Destruction of the European Jews today merits a book length critique. The main reasons are that the 'Holocaust' legend has not changed very much in the interim, and that Hilberg presents the subject comprehensively, in a formal academic style that invites critical examination. Graf does likewise. If the reader will take the effort to examine the sources that Hilberg and Graf use, he will derive, first, a reliable presentation of how the 'Holocaust' allegedly transpired and, second, a perhaps shocking revelation of the shoddy evidence that the legend is based on and, third, a specific important application of a good part of the revisionist scholarship of the past quarter century. The reader will then understand the basis for the title chosen for this book." —Prof. Dr. Arthur R. Butz, Northwestern University, Evanston, Illinois.